CV stands for curriculum vitae. A curriculum vitae is essentially an overview of a person’s experience and other qualifications. 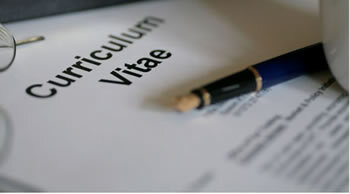 A curriculum vitae (CV) is a document that effectively lists a person’s experience and other qualifications. It is mainly used to provide a general overview of a person’s past history and experiences to a potential employer. It is often the first introduction that the employer has of the applicant; hence, it should be good. CVs are often compared with resumes; however they are two distinct documents. According to UC Berkley, “a resume is a career and educational summary meant to highlight your skills and experience and a C.V. is a list meant to document every job and degree you’ve ever received in your life.” Essentially, a CV is a more exhaustive list than a resume, most often focusing on the education background. While, a resume aims to create a professional identity of a person, as well as showing some aspects of the person behind the resume, a CV aims to create a scholarly identity, effectively breaking down the candidate into his achievements. Furthermore, a CV is usually no more than 2 pages long, often printed side by side on a single sheet of paper. However, it can go longer. Also, while a resume can be used for any type of position, a CV is most commonly used when applying for academic, education, scientific or research positions, as well as for independent consulting in a variety of settings. First and foremost, a CV should include a personal data, such as name, address, phone number, and e-mail address. Next should be a career objective, which states the reason you are applying for the job and what do you hope to achieve while working there. This should be followed by your professional expertise, i.e. a summary of your skills. This section should highlight your best skills, and the skills that would be best applicable for the job. However, also include your other skills, as you never known what might give you an advantage. Then you should list your educational qualifications, including the names of the institutions you attended, which should be listed in reverse chronological order, i.e. latest first. Also, include the degrees received, and in the area of study, participation in special programs, internships, etc. Follow this with the work experience, again in reverse chronological order. Each entry under this heading should include the title of position, the name of organization, location of work, dates of employment, as well as a description of your work responsibilities with emphasis on specific skills and achievements. Next list your Community Service, i.e. volunteer experience, if applicable. This looks especially well on a CV. Follow this with a list of any publications that you might be featured in. This may not be applicable for all jobs, but is especially beneficial if you are applying for an academic position. Next should be your soft skills, including computer skills, languages spoken, followed by your interests, hobbies, or travels. Any extra and/o0r relevant information can also be listed here. Then list your references, mainly "References Available upon Request". Employers will ask directly for references, so prepare a list with names, titles, addresses, and telephone numbers. Also, keep in mind that this is a professional document. So, use professional font and language throughout. Ensure that there are no typos in the document and that the grammar is immaculate. If possible, get someone to proofread the document for you. They may also give you suggestions and help you improve the overall CV.